The Columbus Organization is a Charter Member of NACM. NACM is the ONLY not-for-profit national voice for Case Managers and Service Coordinators. 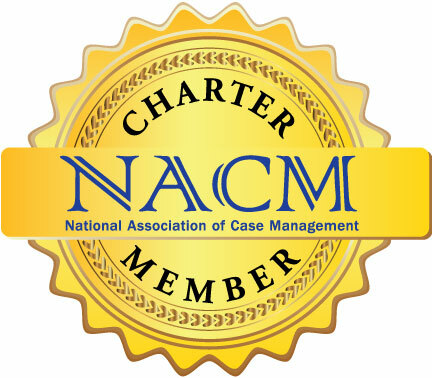 Members of NACM are part of a network of practicing professionals who are advocates for community-based case management systems. These valued members share ideas and work to minimize bureaucratic barriers, practice high ethical standards, support career growth, and promote the vitality and professional image of case management and service coordination. From the beginning, The Columbus Organization has been committed to providing services at the highest level of quality and compliance. The Columbus Organization is certified by the Centers for Medicare and Medicaid Services (CMS), Center for Clinical Standards and Quality, as a Quality Improvement Organization (QIO)-like entity. Working on behalf of CMS, QIO-like entities are independent, objective organizations that improve health care delivery, safety, and efficiency through a combination of collaborating with provider organizations, delivering targeted technical assistance, and providing direct intervention with Medicare beneficiaries and the healthcare community. QIOs work directly with health care providers to ensure the most current, clinically-proven techniques and practices deliver safe, high-quality care. CMS granted our company the QIO-like entity certification based on our success providing peer reviews, mortality reviews, systems reviews, technical assistance and training. The Columbus Organization has been accredited by the Commission on Accreditation of Rehabilitation Facilities for more than a decade. As a CARF organization, we share its mission, vision and values. Under the CARF code, the moral owners of services are the individuals served. When these individuals are unable to exercise self-representation at any point in the decision-making process, individuals served is interpreted to also refer to those individuals willing, able, and legally authorized to make decisions on behalf of the primary consumer. The mission of CARF is to promote the quality, value, and optimal outcomes of services through a consultative accreditation process and continuous service improvement that centers on enhancing the lives of individuals served. Through responsiveness to a dynamic and diverse environment, CARF serves as a catalyst for improving the quality of life of the individuals served. To recognize organizations that achieve accreditation through a consultative peer-review process and demonstrate their commitment to the continuous improvement of their programs and services with a focus on the needs and outcomes of the individuals served. To provide information and education to individuals served and other stakeholders on the value of accreditation. To seek input and to be responsive to individuals served and other stakeholders. To provide continuous improvement services to improve the outcomes for organizations and the individuals served and their community of influence. CARF’s accreditation, research, continuous improvement services, and educational activities are conducted in accordance with these core values and with the utmost integrity. Individuals face a variety of options when deciding what services to use and who should provide them. Accreditation is a sign of quality and is an important consideration in decision making. They look for CARF accreditation in their choice of treatment for a wide range of services including: addiction and substance abuse, rehabilitation of a disability, home and community services, retirement living, and other health and human services. A CARF-accredited service provider commits to quality improvement, focusing on the unique needs of each individual served, and monitoring the results of services. Accreditation requires an internal examination of an organization’s program and business practices including on-site survey conducted by a team of expert practitioners selected by CARF during which the provider must demonstrate that it conforms to a series of rigorous and internationally recognized CARF standards. Based on the results of the survey, CARF prepares a written report of strengths and areas for improvement. If a provider has sufficiently demonstrated its conformance to the standards, it earns CARF accreditation. After receiving the report, the provider must submit a Quality Improvement Plan (QIP) to CARF to show how it is addressing any areas for improvement. Each year, the provider must submit a report to CARF documenting additional improvements it has made.